The Pacific is a thing that’s alive. Like a huge bellows it slowly breathes in and out, and you can mark time by the surge climbing up and down a sandy beach or quay. 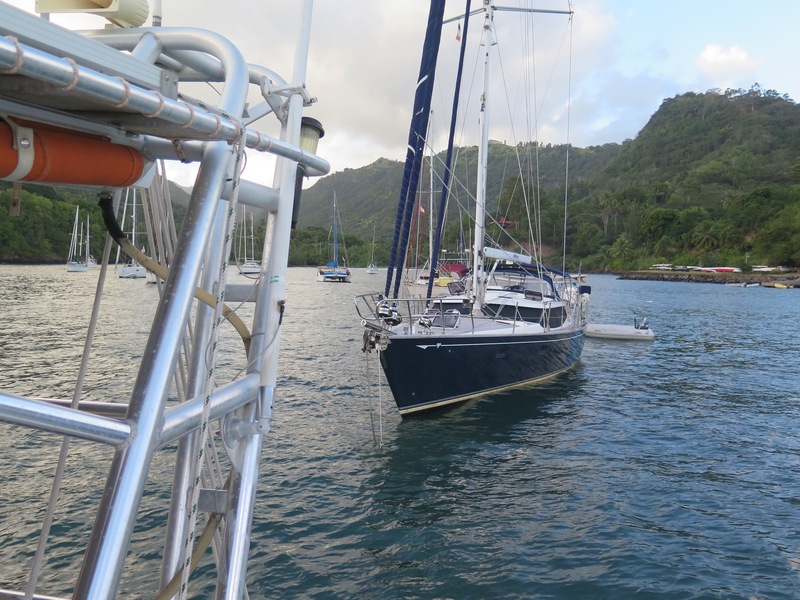 In these parts, the Marquesas, the famous Pacific tidal range is only four or five feet but its effect on anchoring and dinghy handling is pronounced. With the surge pounding the rocky shore of these small anchorages one finds one’s dinghy surging past the dinghy landing only to get sucked back again a moment later. In and out. More forward and backward than up and down. In Hiva Oa the dinghy landing is slimy, crumbling with spawled concrete and rebar and overcrowded. 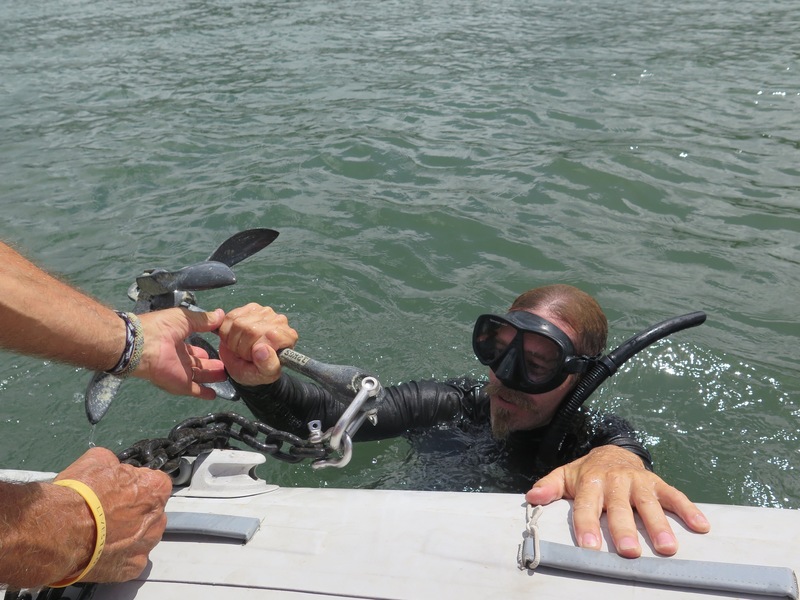 A stern anchor deployed on approach is essential to try to keep one’s poor dinghy from slamming the rebar and concrete or worse, getting jammed under the whole thing. At some point someone had the bright idea to sink chain link fencing near the quay to help the stern anchors hold the dinks off. Our anchor embraced the fencing and for four days it was irretrievable. We just tied the anchor line to the bollard for safekeeping and untied it whenever we came in to the landing. We finally wheedled Tim of Liberty Call to dive in and retrieve it in exchange for dinner. We don’t have a spare dinghy anchor but maybe we should. Every morning we fought off the surging dinghies, all the stern anchors, a dozen or so dinghy painters tied to just two bollards and carefully made our slippery way up the quay to the medium-sized crowd waiting for Sandra the agent to arrive in her black Land Rover Defender to learn if any official word has come down from on high about visas, bond exemptions, duty free fuel papers, customs, or any other requests you may have thought up. Mañana apparently still means “not today” even in French. But if you time it right she’ll give you a ride into town, saving a hot two-mile slog. The surge not only makes dinghy handling difficult but most yachts also use a stern anchor because of overcrowding and all of that Pacific breathing in and out. After failing miserably at stern anchoring we decided to motor over to the “cat box” where several catamarans were swinging in sync to their primary anchors. Peace at last. Eventually, like most good things, our peace at anchor came to an end when a 55-foot Aussie yacht sidled up right beside us and after being warned that he was right over our anchor, shrugged and dropped his considerable ground tackle regardless, then put out a stern anchor as well which meant much stress and worry for several days of close calls. When we finally got our duty-free fuel permit we stowed our dinghy and began to weigh anchor. We’d had enough of this anchorage but sure enough, with our windlass straining, our anchor broke the surface with the other boat’s anchor chain wrapped around it. With all the weight and tension on the chain I couldn’t budge it. Eventually I tied his chain to Escape Velocity’s bow roller with a bit of line and lowered our anchor, untied his chain which dropped like a stone with our line still attached and we were free. Marce backed us out of there just in the nick of time because we’d been pulled inexorably into his boat by the weight of his chain. I like to think when he sees our bit of line tied to his chain he’ll be reminded of his ungentlemanly behavior…probably not. Untangling the chain from our anchor was a close thing taking about twenty minutes but at last we were on our way to Tahuata and we’re told Hanamoenoa Bay is one of the best anchorages in the Marquesas. I don’t know. It’ll be tough to beat Fatu Hiva.